High up, the sun is brighter and one is tempted to forget the valley bottom. It is, however, the vital artery irrigating the surroundings, acting alternately as the driving economic force and the major negative factor. A question of altitude or attitude ? Rupestrine art offers a remarkably rich panorama spanning the entire history of the valley. Since the last glacier period, thousands of figures were drawn, then painted, outdoors on the surface of the rocks. Above and beyond their artistic value and in spite of the difficulties of interpretation, they bear witness to different cultures and perceptions, those of the Alpine civilisations that successively rose and fell in the area between Saint-Michel-de-Maurienne and Bessans. A traditional waypoint when crossing the Alps, Susa, the capital of the kingdom of Cottius, took advantage of its strategic position at the foot of Mont-Cenis. Following its alliance with Rome, the Cottien Alpine province subjected the major Alpine valleys, including the Maurienne, and romanised them. Among the many travellers crossing the famous Mont-Cenis pass, a number, torn between sheer fear and great enthusiasm, wished to inform others. The fascination remains today because the « thousand-year doorway of the Alps » was much more than a simple means of access to sunny Italy. It was also a place of contacts, innovation and confrontation, in short, an important part of European history. Previously considered « white gold », salt progressively lost its standing with the steady progress in conservation techniques. A brief history of the former glorious period and the traces left in the landscapes of the Vanoise valley. Walls take on a certain meaning here. In these border regions where boundaries shifted with each political upheaval, no one spared any efforts to build more. Today, in Shengen Europe, there is a formidable heritage to be shared throughout the Alps. A hamlet perched at 2 000 metres altitude resists yet today at the far end of one of the most beautiful valleys around Bessans. Overcoming snow and avalanches, the inhabitants have long proclaimed their autonomy and forged an original culture combining both Savoy and the Piedmont. Pastoral society left in the Maurienne many signs of an original culture. Ranging from small summer pastures to long-distance transhumances, the daily life of inhabitants was for centuries closely linked to the herds. Certain echoes of this period still ring from one end to the other of the valley. From Vienne to Bessans, two perceptions confronted over time. The writings of a young Austrian ethnographer on a forgotten world are contrasted with an on-site reading decades later. Reactions, questions and fleeting images brought together in sorrow by the history of the century. Michel Étiévent recently published a magnificent work on the factory workers of the Savoy, with old photographs and accounts by the people who lived and worked on these industrial sites in the shadows of the Alps. 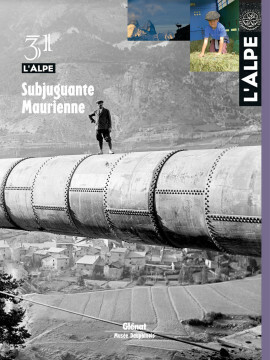 Striking work from the Maurienne. The Bleu de Termignon – Say cheese ! Rare and unique, the Bleu de Termignon can look back over almost three centuries of tradition. The secret ? The Termignon summer pastures and strict observance of the ancestral know-how. In this region known for breeding and dairy, people like to work slowly but surely, and let others know about it ! The history of a passion.